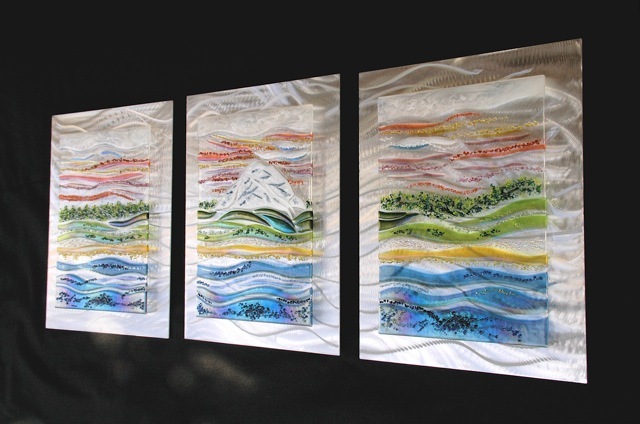 The week prior to my interview with Kim Merriman she received a call from a gallery in Australia inquiring about purchasing a few of her fused glass and metal wall pieces. The sculptures are laid out on a low table in her warehouse ready to pack up and send off. This call is not unusual for Kim. She recently worked with a client in Singapore. I am curious how things got to this point – fielding requests from around the country and world. We start our conversation at the kitchen table. 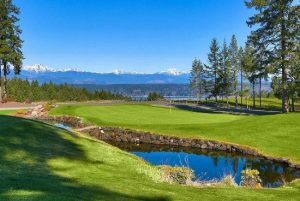 We are in a quiet rural waterfront neighborhood complete with a low flying eagle passing by. Kim tells me about her seven exciting years as Director of Government Relations for The Evergreen State College and how her career path took a dramatic turn. The year was 2000. Like many waterfront homes, the one Kim and her husband purchased had most of the architectural design features facing the water, not the uphill entry way. The set of terraced garden beds they created leading down the hill to their home were attractive, but Kim was frustrated that the first view of the house included the hose coiled on the wall, the water meter, and the utility connections. She eventually developed a design for a privacy screen, metal with colored glass accents that would block the utility wall. Noticing that The Evergreen State College offered an Introduction to Metals Welding class, she enrolled in the upcoming session to make the screen herself! Kim says, “I fell in love with the smell, noise, and industrial concept of the class.” After the first class she came home and told her husband, Scott Merriman,“I’m going to go out and buy all that equipment!” He thought her enthusiasm would wear off. But it did not. That Saturday morning she got up and bought half of the equipment and 1500 pounds of metal. 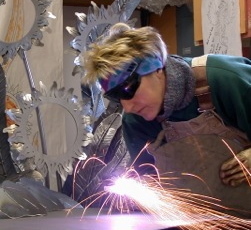 Kim Merriman welding in her studio. 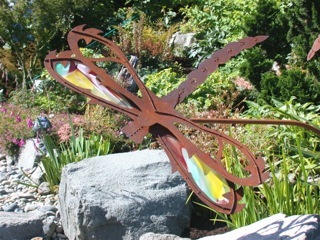 There were 5 lean years creating metal sculptures. “I still remember the first day I was able to buy groceries with the money I made,” says Kim with a tear in her eye. Kim often needed glass with matching patterns for the accents on dragonfly wings. She would search through Bill Hillman’s glass inventory looking for patterns in the sheet glass that were the same or would complement her work. 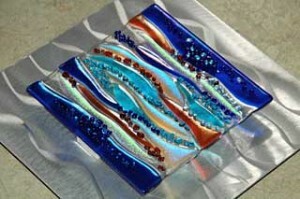 The difficulty in finding the necessary color patterns and the breakage as she acquired glass cutting skills was frustrating. In keeping with her “do it yourself fashion”, Kim made the decision to make her own glass. She bought a kiln and set herself up to make the glass she needed for her sculptures. But, “why waste kiln time?” she asked herself. This question led to another purchase; that of glass molds to make plates. She began marketing them to friends and acquaintances. Her first showing of her plates was at Batdorf and Bronson’s. Setting up for this show posed a problem. There would be too much chance for breakage if her plates were displayed sitting on a table. Kim began to think about how to get her glass plates mounted on the wall. The first thought she had was to make the plates flat instead of slumped. But how to hang them? She woke up in the night with an idea. She would mount the plates on a metal backing. This quickly transformed into the format she uses today. 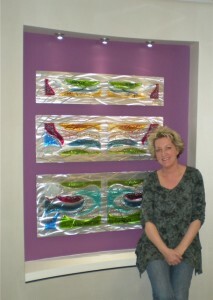 Kim mattes her “glass paintings or Glass Scapes” on metal. 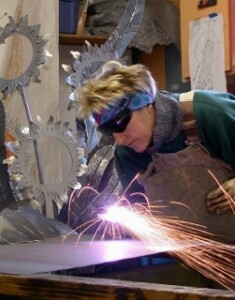 Purchasing the metal cut to size, she then uses a grinding tool to create patterns in the metal before mounting the glass. Kim sent out invitations for the show’s opening at Batdorf & Bronson’s. By the end of the show, she had sold every piece! Six years have passed since then. Clients come from all over the world, finding her through her website. 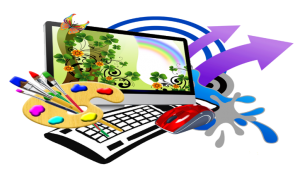 Kim receives 99% of her clients from her web site. Customer service is an understatement in Kim’s business. Kim requests photos of the room where the sculpture is to be hung so that she can understand the colors and styles present in the space. Clients frequently mail her fabric and paint samples to help the color choosing process along. There is an ongoing email dialogue between Kim and her clients that includes step by step photos of the sculpture as it is being created. Recently her seventh installation in a health care facility was mounted. Kim mentions that the use of Evidence Based Design has helped propel her popularity. 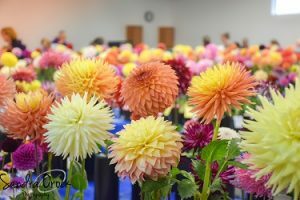 She relates that there is a major push in the health care industry to embrace certain kinds of art; color as healing, art as healing, soothing, etc. 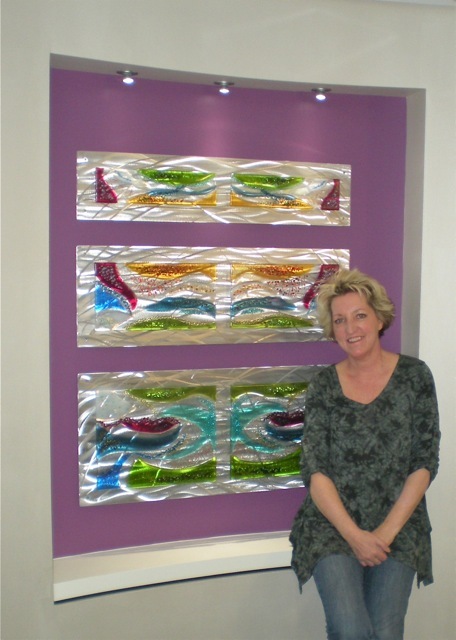 Since Kim’s Glass Scapes are beautifully colorful and “delight clients with their distinct moods and personalities,” her work is a natural fit for health care and business facilities. We walk outside and into her warehouse – an open space with tables, stored sheets of glass, bottles filled with different colors of glass chips, her kiln, welding rig, and metal grinding tools. 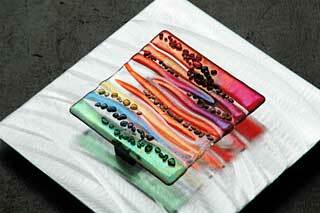 Kim shows me how she arranges the bits of colored glass on the sheets of clear to create her work. We view the pieces that will soon be sent to Australia. Kim Merriman's Triptych - "The 'Sound' Surrounds" installed at the VA Hospital. 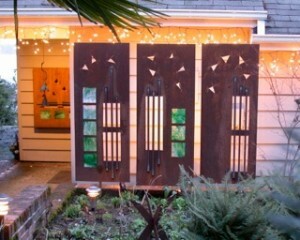 It was in December, the night before the installation of her triptych in Tacoma. Kim was feeling, “melancholy, out of sorts, wistful.” The next day she was at the VA Hospital. She had agreed to personally complete the installation. She measured and re-measured. “There was no second chance,” she explained. Only one hole in the wall was allowed. As she hung her work, one of the doctors walked up to observe. “I want to personally thank you for coming and installing your art,” he said. “Art transforms their lives,” he added, referring to the patients who come to the hospital. She says wiping away the tears, “it was a magic moment for me, a full circle moment.” The moment was further solidified as Kim reflected on her father’s veteran status since she was installing the piece at the veteran’s hospital. I got the impression that Kim felt as if her father had given her his appreciation and approval through this doctor’s words. Kim Merriman's "Tapestry in Motion" installed at the NW Kidney Center.